An offensive explosion finally rocked the Stephen C. O’Connell Center, but it was only a pair guards in senior KeVaughn Allen and freshman Noah Locke getting in on the fun. The Florida Gators came from 13 points down at the half to topple the Texas A&M Aggies 81-72 on Tuesday night. The victory marked one of the most shocking results of the season from Florida (11-7, 3-3 SEC), which shot lights out to take down Texas A&M (7-10, 1-5 SEC) in a massive comeback effort despite a rough first 20 minutes of the game. Let’s take a look at what went down for the Gators in their second straight win. It was over when … freshman forward Keyontae Johnson made a layup to put UF up seven with 1 minute to play. 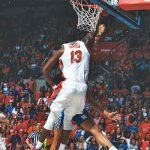 Johnson saw a dunk blocked to begin the possession, but two offensive rebounds by Florida led to the ball finding Johnson again, and he laid it in to put the game away. Allen tacked on two free throws for the final nine-point margin. The Gators trailed by 13 at the half after hitting less than 40 percent of their shots. They turned everything around in the second half, shutting the Aggies down defensively while exploding to drain 11-of-15 shots from downtown (73 percent). A 10-0 run early in the second half put Florida up as the teams tussled for a few minutes. UF then posted a 9-2 run on the back of multiple treys by Allen to go up seven with 6:12 to play, and the hosts never trailed again, leading by as many as 10 late in the contest. 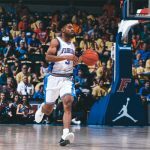 Exceptional efforts: The Gators did not have a 20-point scorer through 17 games this season; by the end of the night, they nearly had two 30-point scorers. Allen (31) and Locke (27) combined for 58 points, making 19-of-34 field goals, 15-of-23 triples and 5-of-5 free throws. They were the first Florida teammates since Erving Walker and Kenny Boynton in 2012 to make six or more threes in a game, and they set a program mark for most triples between teammates. 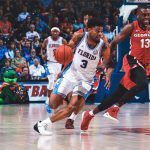 Allen and Locke combined to score nearly 72 percent of the Gators’ points on the evening; they shot 56 percent from the floor and 65 percent from long range, while their teammates shot 36 percent and 21 percent, respectively. What it means: Allen fell one short if his career-high (32), while Locke set a new career-high in scoring. That means more for the former than the latter, as Allen is known to have breakout games, but Locke is still coming into his own as a freshman. If these two can continue to score more consistently, it could go a long way to solving some of the Gators’ offensive woes, but relying on two players is usually a recipe for disaster. Up next: Florida’s next game is the SEC-Big 12 Challenge on Saturday when it will head to Fort Worth, Texas, to take on TCU at noon ET live on ESPN2. SEC play resumes for the Gators next Wednesday.